Joe Studman was born in Clerkenwell and spent his youth wandering the streets of the Capital. For the past 40 years he has lived in Enfield and has discovered the borough’s rich history. He now shares his knowledge and enthusiasm for both areas on his walks, talks and courses. As well as his public walks Joe leads groups for many local societies. His speaking engagements include Townswomen Guilds, Gardening Groups various retirement associations and local societies. 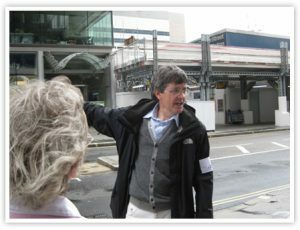 He is a qualified City of London Guide and has guided for The National Trust and English Heritage. Joe believes that guiding is an entertainment and his tours will make you smile as well as inform and educate. Most importantly Joe Studman enjoys meeting people and he will make you feel important and welcome.